The appointment also marked Priyanka's official entry into politics and is expected to boost morale of the party workers in the state which sends 80 MPs to Lok Sabha. 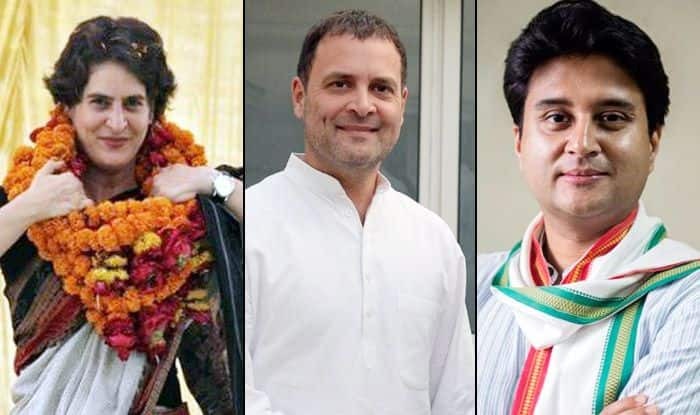 New Delhi: Days after announcing to go it alone in Uttar Pradesh for the Lok Sabha elections after being elbowed out of the SP-BSP bonhomie, the Congress on Wednesday appointed Priyanka Gandhi as the Congress general secretary for Uttar Pradesh East and Jyotiraditya Scindia as AICC general secretary for UP West. The development is seen as a masterstroke reflecting the party’s intent to go whole log in the politically-crucial state. The appointment also marked Priyanka’s official entry into politics and is expected to boost morale of the party workers in the state which sends 80 MPs to Lok Sabha. Interestingly, Scindia’s appointment for the prominent role in Uttar Pradesh comes two days after he met former Madhya Pradesh Chief Minister Shivraj Singh Chouhan, in what was termed as a “saujanya bhent” (courtesy meeting). The over 40-minute close-door meeting between the leaders of two arch-rival political parties raised many eyebrows with the BJP taking potshots at the Congress and claiming that the meeting clearly showed Scindia’s disappointment after being sidelined in Madhya Pradesh. Notably, Scindia, was the front-runner for the CM’s post in Madhya Pradesh but the party astonished many by choosing veteran leader and Sonia Gandhi’s close aide Kamal Nath. Speaking on Priyanka’s entry into active politics, Congress president Rahul Gandhi said he was “very happy” that his sister will assist him in the Lok Sabha polls. On January 12, Samajwadi Party president Akhilesh Yadav and BSP chief Mayawati announced their alliance for the Lok Sabha polls, sharing 38 seats each and keeping the Congress out of the pact in Uttar Pradesh. Terming the development as a “family concern”, senior BJP leader and Union Law Minister Ravi Shankar Prasad congratulated Priyanka Gandhi for the appointment, but questioned the “limited role” given to her. “Priyanka Ji has become General Secretary, my good-luck to her. Since party is a family concern, these kinds of postings are nothing unusual, except to say with a caveat, why she has been given limited role of only Eastern UP? Perhaps her persona merited a wider role for her,” he said. Slamming the “family alliance”, the BJP said that Priyanka’s formal entry into the Congress is an admission by the party that Rahul Gandhi has “failed” in providing leadership. BJP spokesperson Sambit Patra said Congress president has opted for a “family alliance” after facing “rejection” from various parties of the proposed grand alliance. “The Congress has basically publicly announced that Rahul Gandhi has failed and needs crutches from within the family. Because of his rejection by grand alliance parties, he has opted for a family alliance,” he said. Taking a dig at the opposition party, Patra said it was natural that it had to “coronate” somebody from within the family and added that Prime Minister Narendra Modi has projected the Lok Sabha elections as a battle between “naamdar” (dynasts) and “kaamdar” (those who have worked). The new India is asking the question, the BJP leader said, that who will be the next leader in the Congress as he referred to its succession line from Jawaharlal Nehru to Indira Gandhi followed by Rajiv Gandhi, Sonia Gandhi and Rahul Gandhi. “All appointments are from one family. And this is the fundamental difference between the Congress and the BJP. In the Congress, the family is party. In the BJP, the party is family,” Patra said. Scindia’s appointment for the prominent role in UP comes two days after he met former MP CM Shivraj Singh Chouhan. BJP said that Priyanka’s formal entry into the Congress is an admission by the party that Rahul Gandhi has “failed” in providing leadership.